ALL THE TIME GOD IS GOOD! : Understanding Grace: Why do so many reject Radical Grace? Understanding Grace: Why do so many reject Radical Grace? We've been in a series of study on understanding the Radical Grace of God. We've established that we have been completely forgiven of all our sins. This would include all past and present and future sins. We've discovered we don't confess our sins in order to receive forgiveness. We have explored the truth that we are made completely righteous by the Blood and have been made as worthy as God to receive anything we need. We've spent time allaying myths often associated with Radical Grace teaching. Radical Grace isn't a license to live selfishly or sinfully. It isn't a message that produces a lazy or fruitless living. It is not a philosophy of Universalism. Radical Grace is not the great end time deception of the enemy. Then why do so many seemingly reject and resist Radical Grace? I have briefly touched on this topic in an earlier post. You can read it here. As I have said some have a misguided view of Father God. Some have a low self-worth of themselves and their standing before God. Simple instruction from God's Word will decimate these strongholds from believer's minds. There is one particular stronghold that runs deep in the Body of Christ that really fuels this rejection of Grace. So many seem to reject Radical Grace in favor of what they are too familiar with. They label it "Hyper-Grace". From the pulpit to the sermons preached and what is in print we see a continual barrage of attacks against Radical Grace. I am not just referencing the ministers who have written books and made a living by spreading myths about Radical Grace. I am including many of our brothers and sisters in the many churches across the globe. Radical Grace is most often cast aside or given an insignificant place in favor of the alternatives. Why is this? There is a simple explanation. There is a deep stronghold rooted in many of our minds after we've received the Lord. What is this stronghold? In the spirit of honesty, allow me first to say this, most believers agree we can't earn our salvation. They agree readily it is by grace we have been saved. Many many seminaries, denominations, and Bible institutes will readily agree with us. They will agree Grace is key to the Christian faith. 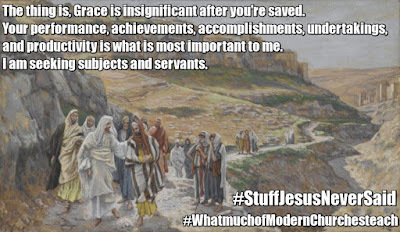 The problem is, (and this is where this stronghold begins to take root) after we receive the Lord Jesus, Grace becomes an insignificant part of the Christian life. This is that stronghold, grace being inferior to achievement and performance. Radical Grace is contrary to many believer's thinking. We have been so conditioned to the alternatives. Why is this? The alternatives to Grace are so much more appealing to our unrenewed thinking. Grace is only factored into the equation of our salvation. Once we receive the Lord it is time to get busy. We need to walk worthy of our calling. Many interpret this into we must work or earn our keep in the Father's house. Much of the Christian World is geared toward achievement programs. In "Faith" and Charismatic circles, many are continually striving to reach a "new level". In many mainline denominations, many are striving to meet the latest goals. The system of achievements, accolades, accomplishment and applause is more comfortable to our unrenewed thinking. Why? It gives us a place to boast. It establishes a hierarchy in the local church. It gives us something to strive for. It gives us a "hope" that possibly we can shine one day in the eyes of others. Ministries prefer this because the "go-getters" will always rise to the top. The kingdoms of men will be built that much faster. Then the ministry or minister will become renowned throughout the land. It's not just the minister, the people also can become boastful. "Look, I belong to this mega ministry...". This is all kingdom of men building and it is so contrary to Radical Grace. The appeal for the alternative of Radical Grace is it gives a measuring stick to men to judge the commitment level of others. In the minds of men, it allows God's opinion of His Church to sway by their performance level. It gives place for God to withhold forgiveness until we "repent" or rather say I'm sorry and really mean it. It regulates forgiveness into an installment plan. It transforms sons and daughters into servants and subjects. This is the stronghold that must be dismantled from our thinking collectively as a Church. The performance, reward mentality must be renewed to the Lord's Finished Work. When we interpret the blessings of God as simple rewards then God becomes an employer who is paying a just deserved wage for good works by His employee. Healing and provision and abundance are already ours by the Finished Work, not our efforts or achievements. Grace is not an insignificant portion of the life of the Believer. Radical Grace is what Christianity is all about. We rely on His Grace from the time when we first receive Him until our last breath or until He returns for us. Those of us who've received this Grace, know firsthand how the accolade and applause system left us weary and burnt out. The performance wheel may be more appealing to our old thinking, but it always leaves us wanting. The enemy and religion will always be quick to remind us how we don't measure up. In summation, many reject this Radical Grace because the servanthood way of Christian living is more appealing. Human effort and the possibility of shining before others is too enticing. This rejection, therefore, is no indication from God that Radical Grace is a false teaching.